The EU's antitrust authority has fined Google and ordered it to allow smartphone manufacturers to choose which search engines and browser apps they install. The ruling could open the way for smartphone makers to offer more choice, with devices running different versions of Android, or offering alternative browsers or search engines out of the box. The European Commission found that Google has abused its dominant market position in three ways: tying access to the Play store to installation of Google Search and Google Chrome; paying phone makers and network operators to exclusively install Google Search, and preventing manufacturers from making devices running forks of Android. Much of the attraction of today's smartphones lies in the apps users can download and install on them, and Google Play offers by far the largest range of apps of any app store for mobile phones. But Google won't let smartphone manufacturers install Play on their phones unless they also make its search engine and Chrome browser the defaults on their phones. In addition, they must only use a Google-approved version of Android. This has prevented companies like Amazon.com, which developed a fork of Android it calls FireOS, from persuading big-name manufacturers to produce phones running its OS or connecting to its app store, Vestager said. Fewer than 10% of Android phone users download an alternative to the pre-installed browser, and fewer than 1% an alternative to the preconfigured search app. That makes it difficult for competitors to Google's search engine and Chrome browser to compete on their merits, she said. Vestager gave Google 90 days to end its illegal conduct, or pay additional fines of 5% of its daily revenue each day it does not comply. What does the Android antitrust ruling mean? "At a minimum, Google must stop and not rengage in the three types of restrictions described," she said. "It can't control which search engines, apps or Android operating systems manufacturers can install." The company is free to decide how it will comply, though. Whether that includes righting past wrongs by alerting existing Android phone owners that they can download an alternative browser or search engine, as the Russian antitrust authority required it to do in a similar case, is up to Google, Vestager said. At a minimum, then, manufactuers should be free to sell Android phones later this year that offer different search engines by default -- perhaps ones like Qwant or DuckDuckGo that promise to respect their users' privacy -- and ship with an alternative browser. And perhaps Amazon will be able to persuade phone makers like ZTE or HTC that installing FireOS on their phones will change their fortunes. Vestager dismissed concerns that Google would be forced to introduce a license fee for Android, making phones more expensive. The company makes enough money from its Play store to more than cover its investment in developing the operating system, she said. How big is Google's Android antitrust fine? The fine, although the largest antitrust penalty the EU has ever imposed, is almost a detail for the company: It has already paid a big fine in another antitrust case relating to comparison shopping search, and still has around US$103 billion on hand in cash or equivalents. 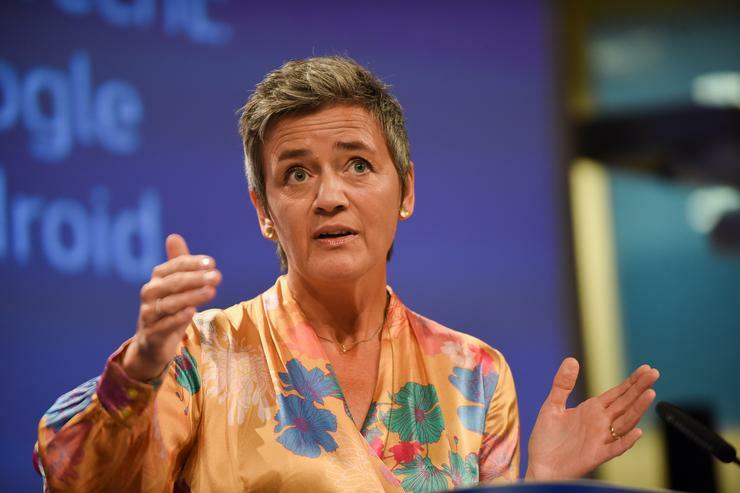 The Commission has the power to fine businesses up to 10% of their worldwide revenue – $111 billion for Google's parent company Alphabet in 2017–- and this fine takes account of the duration and gravity of the infringement, Vestager said.